DEWALT will repair, without charge, any defects due to faulty materials or workmanship for one year from the date of purchase. This warranty does not cover failure due to normal wear and tear. For additional information regarding warranty coverage, please call Enerco at 1-800-251-0001 to speak to the DEWALT Warranty Administrator. For more than a decade, Comfort Zone has grown to become a trusted brand, recognized nationally as a leader in home environment products. Comfort Zone heaters, fans and humidifiers provide safe and reliable performance with exceptional value and thoughtful innovations. As a leader in safety and reliability, Comfort Zone products are designed and tested to meet strict global quality standards including UL, ETL, SAA, CE, CSA and NOM. The Comfort Zone CZ285CN is a ceramic barrel shop utlility heater. Dyna-Glo Delux portable multi-fuel forced air heaters provide immediate relief from cold weather working conditions. Ideal for residential, industrial and commercial applications, multi-fuel heaters require little to no assembly and are 98% fuel efficient. This multi-fuel forced air heaters operates on 1 K kerosene, # 1 diesel, and # 1 fuel oil. Heating coverage areas up to 5,200 square feet. Two heat setting at 180K BTUs and 220K BTUs for two heaters in one. Patent pending variable heat controls, self diagnostics, thermostat, LED readout and cord wrap features included. Dyna-Glo Delux multi-fuel forced air heaters provide immediate relief from cold weather working conditions. Ideal for residential, industrial and commercial applications, multi-fuel heaters require little to no assembly and are 98% fuel efficient. This multi-fuel forced air heaters operates on 1 K kerosene, # 1 diesel, and # 1 fuel oil. Heating coverage is up to 3,200 square feet. Self diagnostics, thermostat, LED readout and cord wrap features are included. The Dyna-Glo Delux 400,000 BTU portable multi-fuel forced air heaters provide immediate relief from cold weather working conditions. Ideal for residential, industrial and commercial applications, multi-fuel heaters require little to no assembly and are 98% fuel efficient. The operate on 1 K kerosene, # 1 diesel, and # 1 fuel oil. Heating coverage area is up to 8,500 square feet. Includes digital self diagnostics, thermostat, LED readout, secondary power outlet and cord wrap. 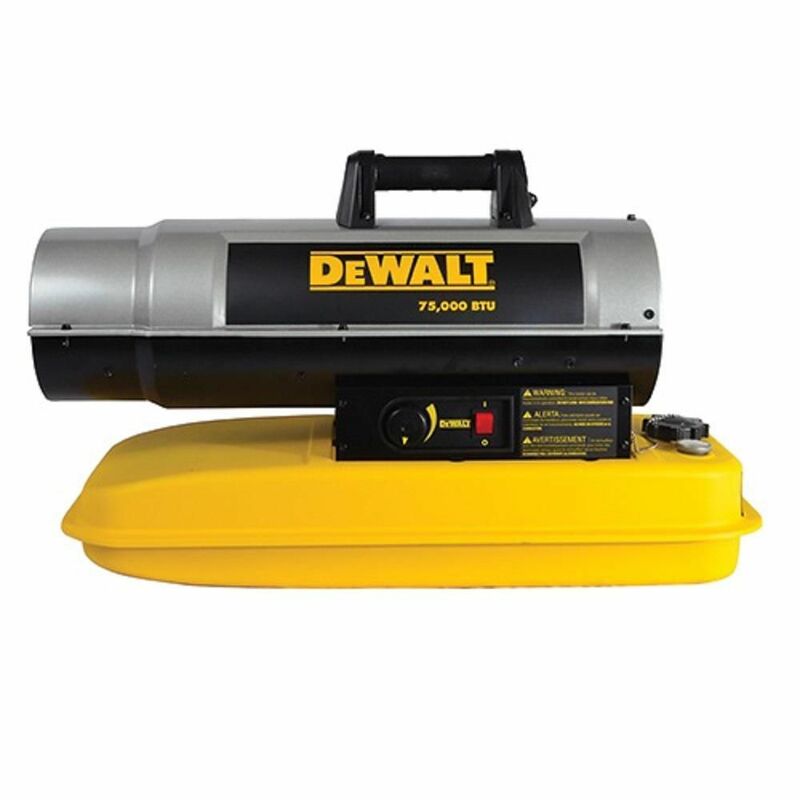 Forced Air Kerosene Heater 75,000 Btu F340675 DEWALT<sup></sup> industrial forced air kerosene heaters, are construction-grade quality built for the Canadian winter. They're fully equipped with a roll cage, durable barrel design and front storage compartment. They're typically used for workshops, barns, job sites, and home remodelling. CSA approved, and tested on the jobsite, they're Guaranteed Tough. Forced Air Kerosene Heater 75,000 Btu F340675 is rated 4.5 out of 5 by 26. Rated 5 out of 5 by Keith from Works as advertised. Works as advertised. Rated 4 out of 5 by Al from Just recently purchasing this heater I've only gotten to use it a few times. It replaced an older... Just recently purchasing this heater I've only gotten to use it a few times. It replaced an older heater. For the price I like the fact it has an on/off switch and a thermostat control. Rated 5 out of 5 by Rick from Works great... Thermostats a little sketchy. But other than that nice product. Works great... Thermostats a little sketchy. But other than that nice product. Does this heater run on diesel as well as kerosene? Most will run on Diesel also so not sure why this would not. However Kerosene is always preferred. I guess diesel being a dirty fuel may plug up sensitive small jets over time and also one will smell a strong diesel odor. I have 3 heaters of this type and the manual recommends Kerosene and only if Kerosene is not obtainable Diesel can be temporarily used. I have only used Kerosene and after 5 years mine all run like new.